What?? Another post on HBW?? I won't always have posts for HBW but I've been brewing a lot lately so I have a few posts scheduled to release. 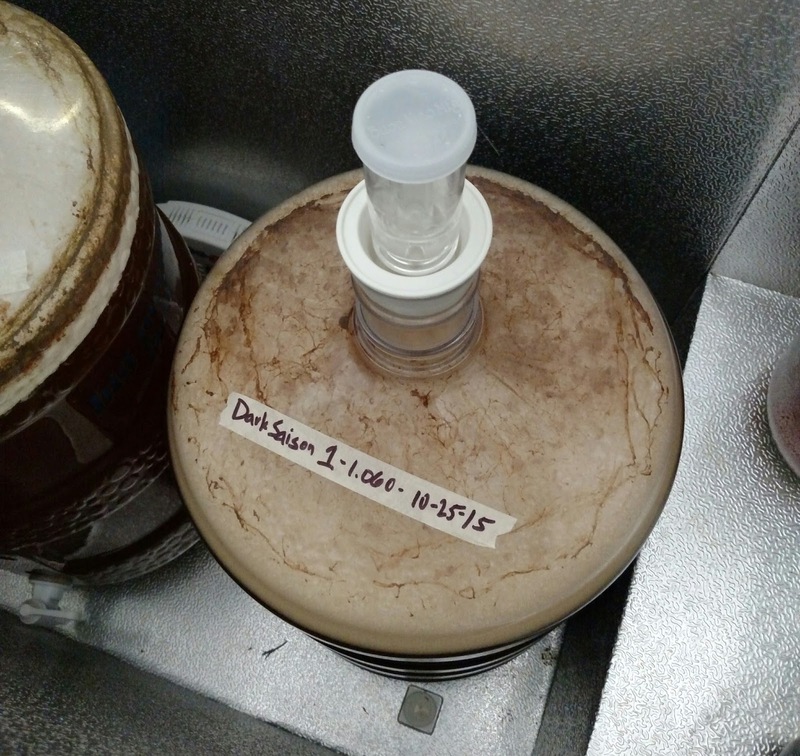 If any of you have read Michael Tonsmeire's blog, and I'm sure a lot of those reading this has, then you've seen his yearly post about a Dark Saison he and some of his buddies brew. I took some inspiration from that and decided I wanted to do a Dark Saison or what can be called a Saison d'Hiver. 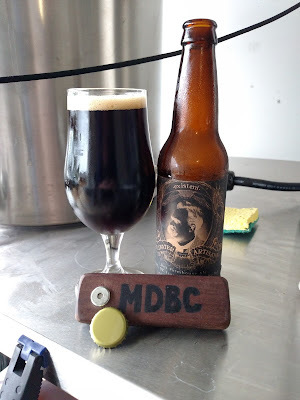 Close to two years ago I brewed one very similar to this recipe from Maltose Falcons and it was okay, but nothing special (due to me not the recipe). I changed the grist up just a bit and I fermented it with White Labs WLP585. I then aged it in secondary on a vanilla bean and a cinnamon stick. Young, it was way too much spice from the cinnamon.. As it aged, it just seemed to turn into a Belgian Dark Strong Ale. A good beer but nothing great and definitely not dry enough. This year I wanted to take another stab at it and get something funky added in the mix. I took to his book and his blog to go through each recipe and find something I could build my brew from. Here are some links to each of his beers. As you can see there is a ton of information on his blog about these dark farmhouse beers. There is a plethora of other information there as well. I took what I gathered from him and developed the recipe below with what I had on hand at the house. Estimated OG: 1.070 SG  Actual OG:  1.060 SG  -  Way over sparged. Cherry Funk with the Wyeast Biere de Garde 3725. The recipe just seemed to fit the bill of what I was wanting. I got to use some of the Dingeman's Pale Ale malt that I still have. That malt just seems a bit too sweet for my liking in lighter Saison brewing. But when I'm wanting something dark and to have a residual malt character, this could be a great base. I was thinking about using Vienna or Maris Otter for my base malt but, I had the Pale Ale on hand. I added some Caramunich I for color and the caramel/malt flavors, flaked rye for the body and mouthfeel, and then Midnight Wheat for more color addition. For the hops, Bramling Cross just scream dark farmhouse beer to me. Spicy with hints of black currants was the description. I added enough to get right around 25 IBUs and called it good. Wyeast 3725 may be called Biere de Garde but there are many folks saying it's actually a Saison yeast. Either way, it should work for me in this beer. I wanted to give it something extra too though. I added in GigaYeast's Sour Cherry Funk. With the IBUs where they are, it may take some time for it to sour. That will be ok as it will give the different brettanomyces strains in there a head start. It will also test to see if the lacto there will drop the pH over time. I've got a theory that even with hopping at a rate like I did that the pH will drop given enough time. I didn't take a starting pH for this beer but I will see where the pH is after primary fermentation. I'll check it periodically as I'm waiting for this to mature. I'm still not sure on fruit additions either. Maybe some cherries will play nicely. I'll decide that when the beer is finished and see what will compliment the best. Sorry for being that guy and videoing this portrait instead of landscape. I'll fix that on future videos if I film with my phone! I've gotten a new camera recently to start filming most of my brew days with. Drinking farmhouse while brewing farmhouse! Existent is a great example of the style from Stillwater. 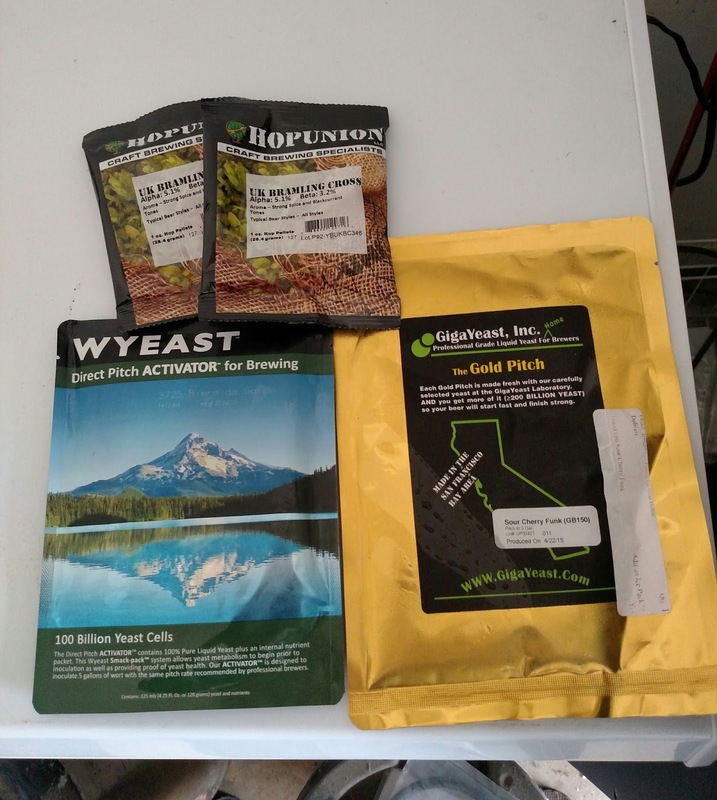 Some things to note that happened on this brew day. I ended up way over sparging and having a boil volume close or just over 10 gallons. For this new system I've been trying to get somewhere around 9.25-9.5 gallons. My last brew efficiency was spot on. I'm attributing this miss of starting gravity to the over sparge. I could have boiled longer but that would have off set all my hops and additions so I didn't worry about it. I'm still pretty green with the new system but I'll get better. Cooling went much, much better this time around. I made sure all my connections were good and tight and did a re-circulation through the heat exchanger while the wort was still close to boiling temps to sanitize. Then I turned on the hose and let it drop to 125F before dumping ice in the pre-chiller. I was able to run 72F and eventually 68F wort into the carboy. I collected probably just over 5 gallons and then pitched the two yeast packets. This was a much better brew day overall. I still made some mistakes and I'm sure I'll continue to have some while dialing in the system. Preparation and sanitation are key for me. I like to have everything laid out in front of me to be ready when I need to use it. I'll do a good detailed write up about my system and my process while brewing soon. There have been a few folks asking for that lately. 10-26-15: Didn't see a lot of activity in the AM but by 4PM she was rocking and rolling! Updates: Picked up some tart cherry juice to bottle this one. Will be bottling soon. 3-7-16: Bottled with 48oz of tart cherry juice.